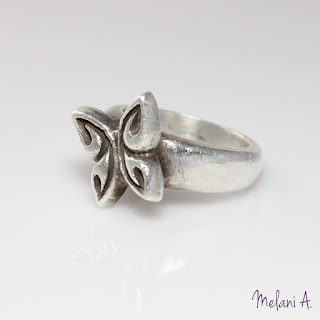 By the way, this ring has butterfly inspired shape. This 999 Fine Silver ring is created with metal clay during one of my class in jewellery fabrication. It took a while to sand and polish this ring to make it really smooth and shiny. Currently I don't have any fine silver jewelry pieces in my shop but I would like to include them in the future.